Simon & Schuster/Paula Wiseman Books, 9781481415453, 224pp. With co-author Freeman, Kelly takes readers back to 1975, when long-distance telephone calls cost money, calculators were expensive luxuries, and Americans fizzed with excitement about the U.S. space program.Former astronaut Kelly takes a cool biographical fact—he and his identical twin brother, Scott, are the only siblings ever to fly in space—and spins it into an absorbing adventure. To get visiting 11-year-old twins Scott and Mark out of his hair, Grandpa suggests they build a spaceship. Taking him at his word, they enlist the help of brainy Jenny O'Malley and their neighbor Barry Leibovitz, a math nerd, and so begins a summer of clandestine research and construction. Eventually the team expands to include Howard Chin, who has a computer, and Lisa Perez, whose dad owns an auto body shop. The team studies physics at the library and scrounges for materials, promising all the adults they won't blow anything up. The kids' enthusiasm is infectious, and Kelly's expertise comes through in telling, kid-friendly details, as when Barry's older brother, a former pilot and Vietnam POW, takes them on a trip to an amusement park to determine which kids have the right stuff. If the characters often speak in infodumps, it's because they are learning along with readers, and the information imparted is staged just right. Intriguing subject matter and rock-solid pacing combine for a nifty adventure—one that may well spark a new generation of astronauts. In 1975, 11-year-old twins Mark and Scott attempt to stay out of trouble by doing something constructive in Grandpa’s workshop. Their secret project? Building a rocket that will launch them into space. While their bravado and enthusiasm outpace their practical know-how, they bring in four other kids who contribute resources and skills (Howard’s computer, Lisa’s welding ability, Barry’s math smarts, and Jenny's understanding of physics. Intensely focused, the six kids work hard to carry the project through, solving problems cleverly while misleading the adults around them. Writing with Freeman, former astronaut Kelly (whose own twin is astronaut Scott Kelly) offers an adventure in which readers can learn (along with the two protagonists) about rocketry, space travel, teamwork, and the value of having a purpose. In an author’s note, Kelly separates the story’s fact from fantasy, while an appended glossary explains science references more fully. From bickering twins to space-race history to a secret rocket-fuel formula, this chapter book offers an entertaining mixture of reality, historical fiction, science, and fun. HIGH-DEMAND BACKSTORY: Kelly’s Mousetronaut (2012)picture book was a number-one bestseller, and with this middle-grade novel, he looks on track to greatly expand his orbit. Former astronaut Kelly (Mousetronaut) digs into his own childhood and NASA background in this layered story. Launching the Astrotwins series, the novel is set in 1975 New Jersey and introduces the Kelly twins, impulsive Mark and more level-headed Scott, who share a curiosity about space travel and a knack for finding trouble, especially when it comes to disassembling gadgets. On a visit to their grandfather's lakeside cabin during the summer before sixth grade, they embark on their most outlandish escapade yet. 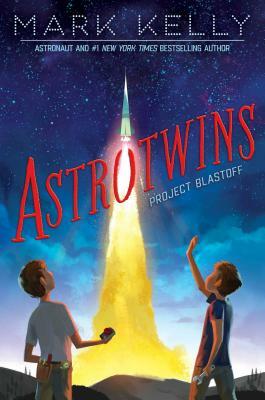 Along with several friends—including a physics prodigy, a computer whiz, and a mechanic's daughter—the twins build a spaceship capable of orbiting the Earth. Kelly and Freeman (the First Kids Mysteries series) mingle fact and fiction as they use the friends' own voices and thought processes to distill scientific and mathematical properties involved in spacecraft construction and rocket propulsion. Though the fantastical prevails when they achieve liftoff, realistic sibling and peer relationships, illuminating science, and some streamlined aeronautical history keep the story grounded—in a good way. When 12-year-old twins Mark and Scott Kelly ruin their parents’ calculator after they take it apart (an expensive item in the mid-1970s), they are sent to spend some time with their grandfather at his Greenwood Lake home. He suggests that they channel their formidable energy into building a go-kart. They decide to pursue their interest in the space program instead and build a rocket ship. While they are admittedly indifferent students, the gregarious twins have smart friends. Soon, in finest NASA tradition, they have built a team that includes a math whiz, a science genius, and someone with a computer, among other terrifically skilled kids. They spend hours researching in the library, sharing, collaborating, and arguing. They convince the unsuspecting adults in their lives to chauffer, mentor, and supply, all with the promise that they aren’t going to “blow anything up.” This lively tale requires a huge suspension of disbelief; readers who can let go and enjoy the ride will find much to like in these spirited siblings pursuing their passion and negotiating egos as well as obstacles. Coauthored by retired astronaut and U.S. Navy Captain Kelly, this series opener is perfect for teachers and librarians looking for fiction embedded with STEM (science, technology, engineering, and math) concepts. VERDICT The characters are likable, the dialogue is enlightening as well as snappy, and the adventure is grand; a fine purchase for middle grade collections.